It makes sense that everything you put in your body—be it food, water, smoke or alcohol– could play a role in your fertility. In this post, we’ll be focusing on diet. (See my other post about specific foods to eat here.) There has actually been a lot of research about diet to improve fertility. I’ve translated the science into practical advice here. My first tip may be surprising. High protein and no grains? Not the best diet for fertility. Wait, what?! 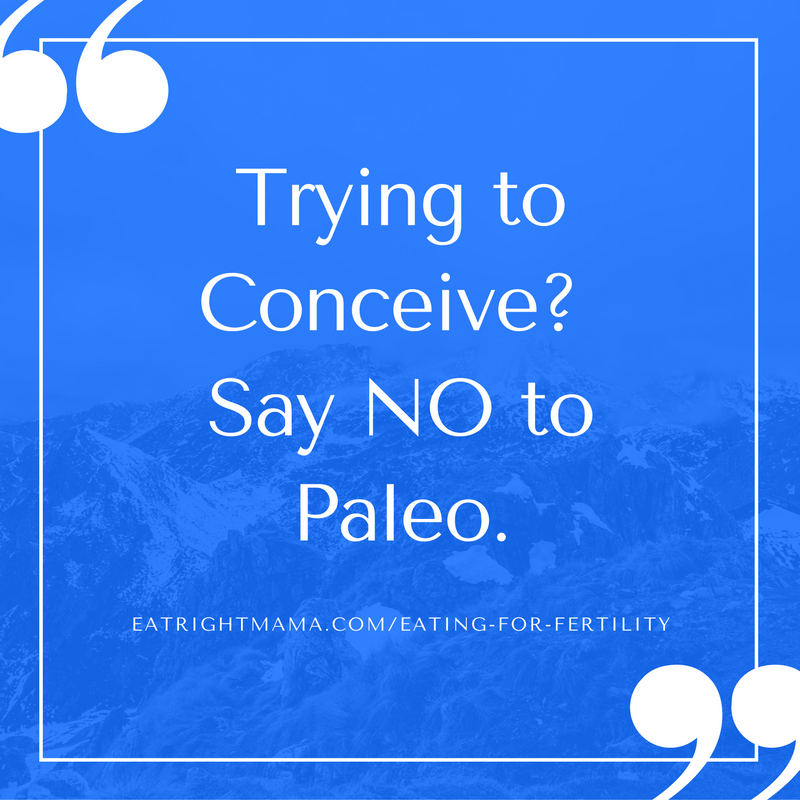 Paleo may be the hottest thing on the diet horizon right now, and some aspects of the diet are actually good for fertility. For example, getting much of your carbs from fruits and veggies is a great idea, so is eating nuts and seeds and putting a stop to processed foods. But paleo emphasizes eating more animal protein. Doctors at Harvard found that replacing carbs with animal protein was linked to a 32% higher risk of infertility in women. The saturated fat that often comes from animal protein isn’t good for fertility either. A Danish study showed that men with the highest saturated fat intake had a 38% lower sperm concentration and a 41% lower total sperm count compared to men with the lowest intake of saturated fat. Grains are also a no-no on paleo. A recent study in the American Journal of Clinical Nutrition reviewed 33 studies on the effects of eating whole grains and risk of cardiovascular disease mortality, cancer mortality and all cause mortality. The more whole grains eaten, the lower the risk of death from all causes, cancer and cardiovascular disease. We know that the nutrients and fiber found in whole grains are great for blood pressure, digestion and general health, so why cut them out? See “Go Dutch” below to find out how whole grains work in the preconception diet. Paleo also recommends you cut out all dairy—which may not be a good idea for fertility for many American women who already don’t have enough calcium in their diet. 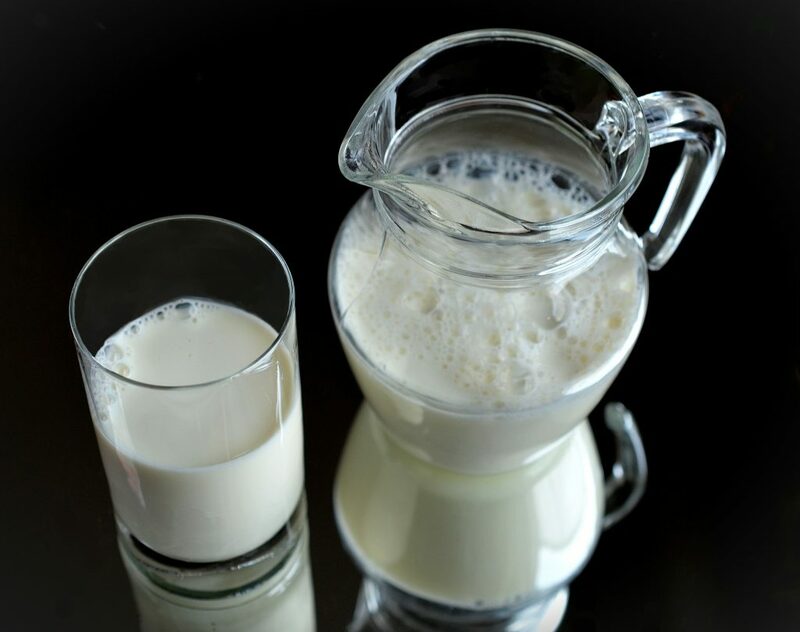 Though it’s definitely possible to get your calcium from veggies or fortified foods, I just don’t see that happening with most women and we know that calcium from food is the best choice. Getting your calcium from unfortified food sources requires eating with intention and planning. A 2010 study confirmed that eating like you’re living on the Med, meaning eating more veggies, fish, legumes and vegetable oils and fewer snacks, is good for fertility. Following this diet closely meant a 40% increased chance of pregnancy on day 15 after embryo transfer. The Mediterranean diet, with it’s focus on fruits and veggies, and legumes, is likely to increase your intake of folic acid, vitamin B6, iron and zinc, which are also important for fertility and a healthy pregnancy outcome. A large study in the Netherlands that looked at pre-conception diet and IVF success found that following the dietary recommendations of the Netherlands Nutrition Center, had a 65% increased chance of having an ongoing pregnancy. So what were those recommendations, you ask? See them below. Protein: At least 3 servings of meat or meat substitute and one serving of fish weekly. Though avocados are not traditionally part of the Mediterranean diet, avocados are a “Mediterranean-style” food due to their antioxidant and fiber rich content and the fact that they contain primarily monounsaturated fat (also known as MUFA.). 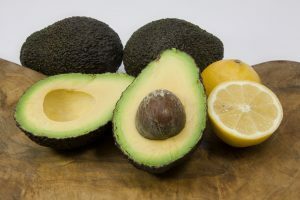 The Nurses Health Study showed that consuming just 2% of energy from unprocessed monounsaturated fat (such as from nuts, seeds and avocado) instead of hydrogenated trans fat, was associated with less than half the risk of ovulatory infertility. A MUFA rich diet is also linked to a more than 3 times higher odds of having a live birth after IVF. And when high fat, high fiber foods like avocado are added to a meal, they decrease they glycemic load, thus decreasing it’s effect on blood glucose. Find quick and easy recipes using avocado here. 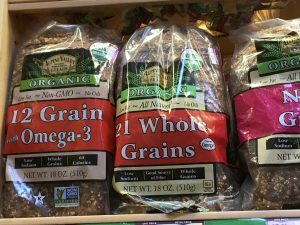 Whole grains like whole grain bread are good for you and for your fertility. But moderation is key! Over and over, eating foods with a lower glycemic index has been shown to improve fertility, not to mention improving the long term health of your baby. In my book Eating Expectantly, I talk about smart carbs a lot. So what falls into the category of “smart carbs”? The amount of carbs you eat are important too. For overweight women, a lower calorie, low-glycemic index diet helped with weight loss and had an 85% increase in oocyte retrieval during IVF. I’ve done that here on a separate post about the Glycemic Index. 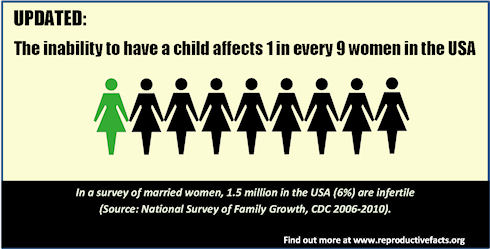 Also, remember that an antioxidant-rich diet is good for both women and men who are trying to conceive. Fruits and veggies along with whole grains, nuts and legumes are the best sources of antioxidants. See this post to help you find more ways to eat your veggies! 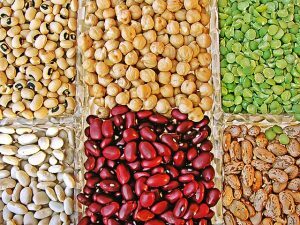 Beans are a great example of plant-protein based smart carbs. In the Nurses Health Study, women who ate a higher percentage of plant protein were at lower risk of having ovulatory infertility. Think bean burrito, meatless chili, and tofu stir-fry for some quick meal ideas. See my post Vegetarian Shopping Guide for more info. Yep, the word is out—sat fat is bad and so is trans fat. (So… blanket generalizations are a bad idea-both in science and politics, so I need to tell you there are some specific saturated fatty acids that are good for you, but that goes beyond the discussion here.) But we can count the ways that saturated and trans fat can negatively affect fertility. Higher amounts of saturated in the diet have been linked to higher risk of ovulatory infertility and decreased success in IVF outcomes. Trans fats have been shown to decrease men’s sperm count. The more trans fat in the diet, the lower the sperm count! High fat animal protein–think bacon, sausage, less than 90% lean ground beef, the fat on chicken, steaks, fish etc. Coconut oil is a highly saturated fat and in the last few years has been aggressively marketed as a healthy fat. The jury is still out on this, though it is leaning towards the positive benefits of coconut oil. Most health professionals recommend you treat it like any other saturated fat and eat in moderation, just like butter. One recent study suggested that coconut oil raised total and LDL cholesterol more than other plant based unsaturated oil. On the other hand, people in the South Pacific whose main source of fat is coconut oil have a lower risk of cardiovascular disease and other recent research suggests that eating an oil rich in lauric acid such as coconut oil may improve the total cholesterol to HDL ratio. 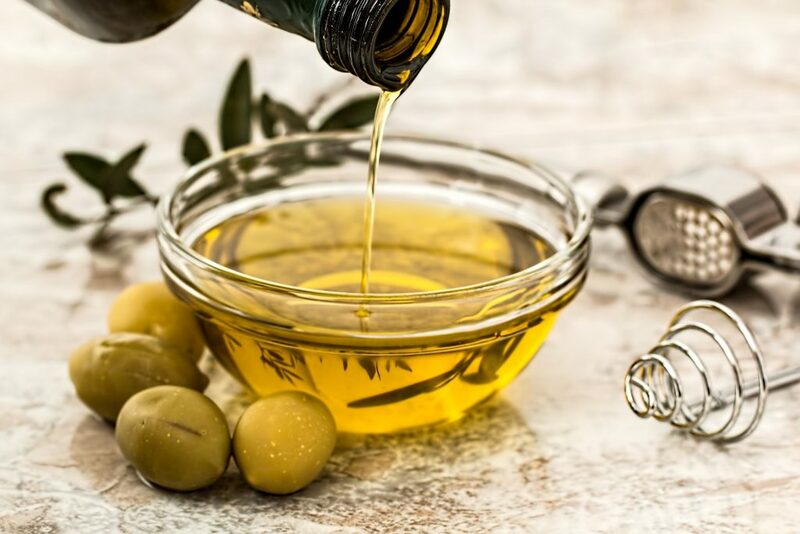 Extra virgin olive oil is a good choice for cooking, but not frying. Harvard researchers found that women who took a multivitamin on most days of the week had a lower chance of having ovulation problems. Speaking of vitamins, men who took antioxidant supplements were more successful in getting their partners pregnant, and for the pregnancy to proceed to a live birth. Also taking 400 micrograms of folic acid is recommended for all women of childbearing age because it helps prevent neural tube defects. Make sure your multivitamin contains folic acid. Drink your milk, and make it whole. Following a healthy preconception diet can cut your risk of infertility. Trying to Conceive? 14 Foods to Eat Right Now! Is Your Body Ready for a Baby? Take the Quiz! Check out our upcoming Twitter Chat! This is great info for women! I just did a project on bariatric surgery & infertility and have been learning all about nutrition & fertility while finishing my masters. It’s fascinating stuff! This is a great run down. I think it highlights the importance of not cutting out any entire food groups because they all have their own source of nutrients. Very educational! Very helpful information, Bridget. Great post! An interesting read. Thanks for sharing! This was such a great read. Very informative! Saving for later for sure! One’s diet can definitely make a difference in fertility outcome. Great advice! Great article, Bridget! Sharing on Pinterest. Baha. Love how you break down Paleo – Amazing! !